Kona Dog Food Truck offers just what you'd think they do: Hot Dogs with a Hawaiian Flair. And you know what? It works! We were at the Lake Mary Food Truck Crave and my friend Tommy--a huge hot dog fan--just had to have one of their hot dogs. It was all that a good hot dog should be. The "bun" was what you'd think of as a Hawaiian roll or bun-- a nice, sweet, egg-rich bun. The hot dog itself was top of the line, a very good dog, certainly no "ocar mayer" run of the mill dog. Add to that the "normal" accoutrements of mustard, onions, and pickle relish and you have a home run--and this was certainly a home run. 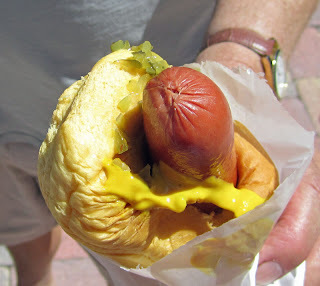 I don't eat hot dogs all that much, but the next time I do, this will be the standard I measure by--it was that good!